Entries from Digital Intelligence tagged with "mexico"
Performance marketing firm TradeTracker is continuing its expansion and growth phase with new operations in Mexico. 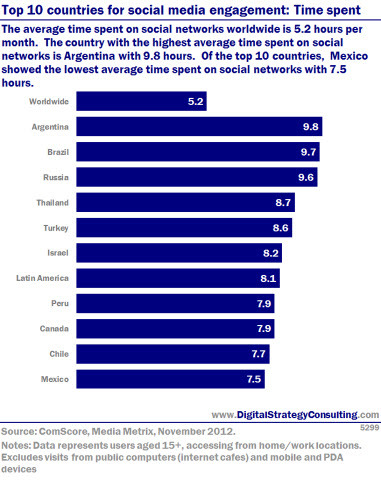 The real World Cup may have gone to Germany, but Mexico has the biggest social audience, according to new research. Digital ads will lead the way for global media growth in the next four years, accounting for 33% of total advertising revenue, nearly catching TV in the process, according to a new report. In the biggest technology deal of the year so far, US telecommunications giant ATT has bought broadcast satellite service provider DirecTV for nearly $50bn (£29bn). This chart shows the percentage of each country's internet population who have bought something online. 40.4% of the worldwide internet population will make a purchase through a digital channel this year. Western Europe's online population is very engaged in terms on online purchases, but countries in the Asia Pacific have significant room for growth in coming years. Android continues to dominate the global smartphone market, with Windows Phone slowly catching Apple’s iOS in second place, according to new data. According to research firm comScore, Latin America’s online population grew faster than any other global region in 2011, rising 16 percent to 129.3 million visitors in December 2011. 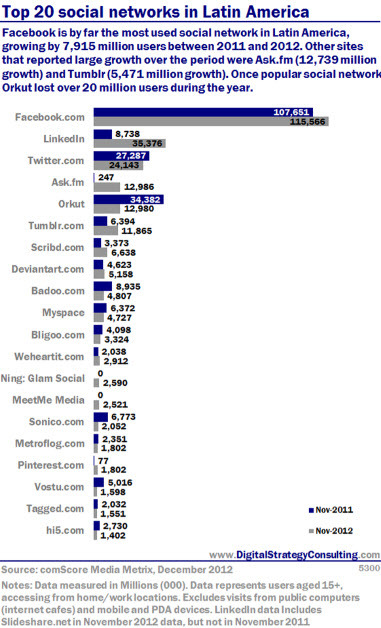 Google Sites reigned as the most-visited property in December 2011, reaching 123.4 million visitors in the region, while Facebook.com led as the most-engaging web property accounting for 25% of all time spent online in the region. This chart depicts the projected growth of global adspend between 2011-2014. It is predicted that 60% of the world's adspend growth over this 3-year period will come from developing markets. 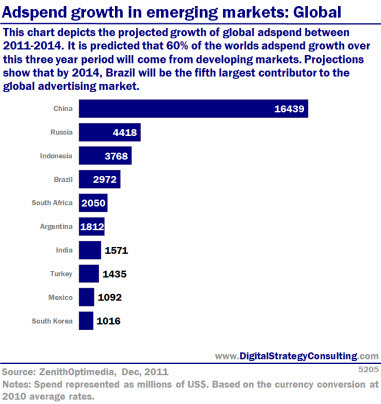 Projections show that by 2014, Brazil will be the fifth largest contributor to the global advertising market. The Cannes Cyber Lions showed why owned media is key and how not to simply add to the clutter of the web. In digital advertising the big players battled hard, with Google opening AdWords to 300,000 apps via its AdMob integration, while preparing for the European rollout of its web TV service. Facebook launched a major ad push, creating deeper ties with Apple, Zynga and WordPress, scrapping 'credits' for local currencies and opening to third party ad platforms for first time. Twitter upped its game with its first TV commercial and curated hashtags for brands, while revealing it's mobile ad revenue have overtaken desktop PCs. Microsoft showcased its iPad rival 'Surface', but was forced into an embarrassing U-Turn on its proposed plans to make 'Do Not Track' the default option for its next IE browser, after much outcry from advertisers. The were some major acquisitions this month, with Facebook buying a facial recognition firm, Salesforce buying Buddy Media and WPP snapping up AKQA. This month we include a guide to Pinterest, Mary Meeker's 'State of the Web' presentation and the DMA's implications of the new EU cookie laws for email and mobile marketing. We also take a look at Social media SEO, with growing evidence that Facebook and Twitter now play a key role in determining Google search rankings. Full stories and charts below and on click through. More than 127 million Latin Americans ages 15 and older visited a social networking destination from a home or work computer in April 2012, with the average visitor spending 7.5 hours social networking during the month, according to new research.